Sara Lewis won me over from the very beginning of her book Silent Sparks: The Wondrous World of Fireflies, then kept me captivated right through to the "Notes" in the back. 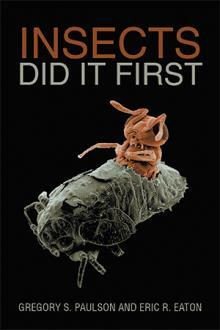 This offering from Princeton University Press is literally the gift that keeps on giving. More on that in a moment, but prepare to be dazzled and amazed in the meantime. "And I've tried hard to retain my sense of wonder. But wonder, it turns out, doesn't garner much respect within the realm of academic science. We academics are rewarded for our scholarly productivity----getting research grants and writing technical articles that report our discoveries. Few scientists openly admit to being motivated by wonder. By some unspoken rule, a scientist's feeling of awe for the natural world must be kept under wraps; to acknowledge wonder is tantamount to unreason, and therefore treason." The fact that Lewis is able to not only maintain her own sense of wonder, but actively spark it in her readers, is the whole heart of this book. Lewis does not talk over the head of her audience, but neither does she talk down to non-scientists. There is a glossary in the back of the book, but she defines technical terms the first time she uses them in the text. While the book is not lavishly illustrated, her words paint vivid pictures on the pages that lack graphics. You are transported to the dewy meadow at midnight, and the laboratory back on campus. You gaze with new perspective off the back porch at your own lawn; and travel to far-off lands to witness synchronous spectacles that defy your imagination. You also meet a number of Lewis' colleagues and mentors, and get a feel for who they are and what motivates them to study fireflies. 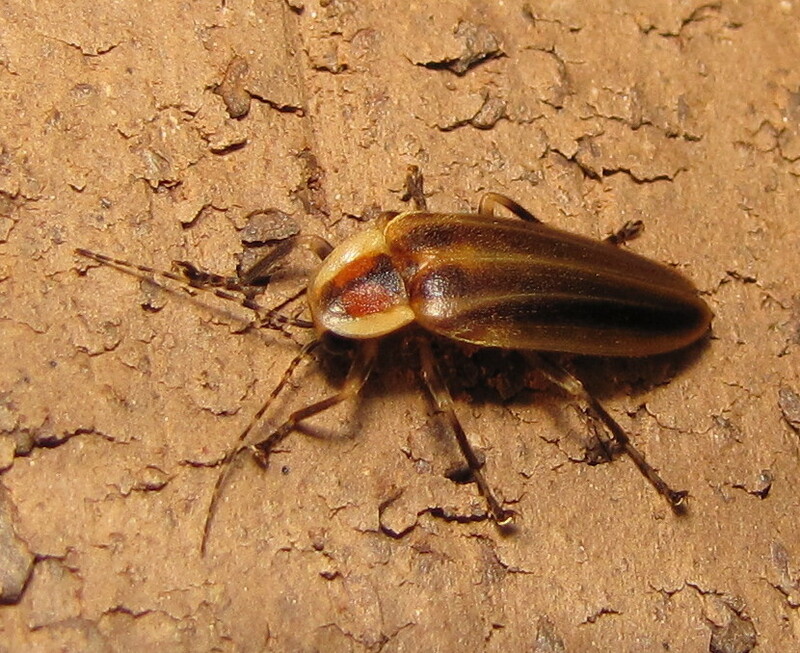 It would be easy to go overboard and focus mostly on the human element in the story of any invertebrate, as many authors do (Sue Hubbell, Richard Conniff for example), but Lewis recognizes the ability of organisms to be sufficiently captivating in their own right, and retains focus on the fireflies, not the scientists studying them. I heartily applaud this aspect of her writing. 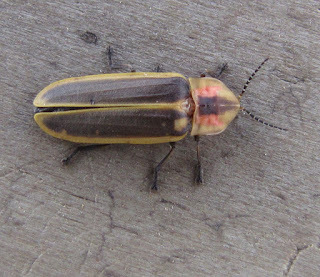 Because fireflies are so diverse, and with few exceptions not impactful to humans in the economic sense, we consequently know very little about them. 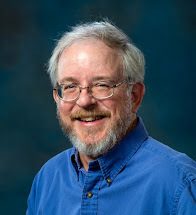 Most of the advances in our collective knowledge have come within the past couple of decades, thanks in part to our ability to deconstruct DNA sequences and reconstruct new paths of evolutionary relationships. 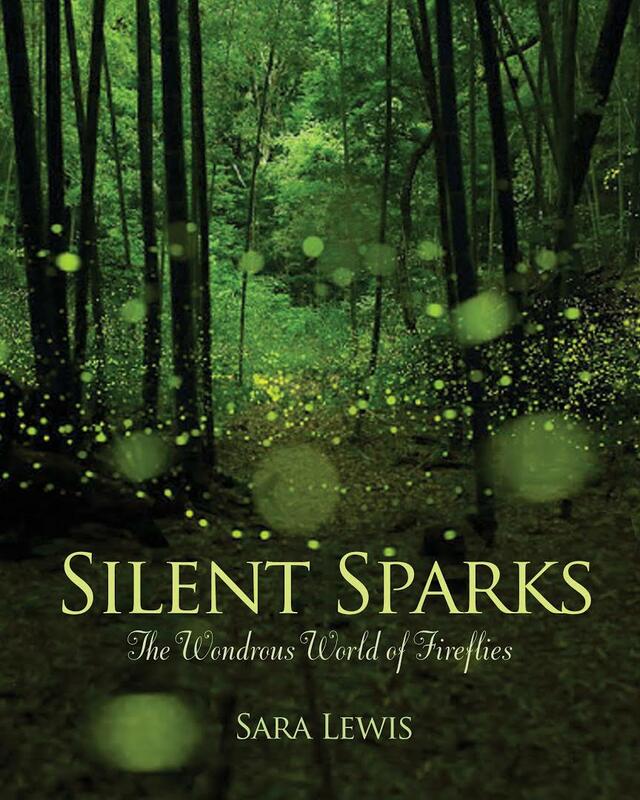 Silent Sparks provides an outstanding summary of our history of scientific inquiry into the Lampyridae, and then encourages the reader to enlist herself or himself as a citizen scientist to expand our horizons even more. By the end of the book you will be writing the author in application to be on her lab team. There are few errors or omissions in this book to even bother to nit-pick, but one baffles me completely. 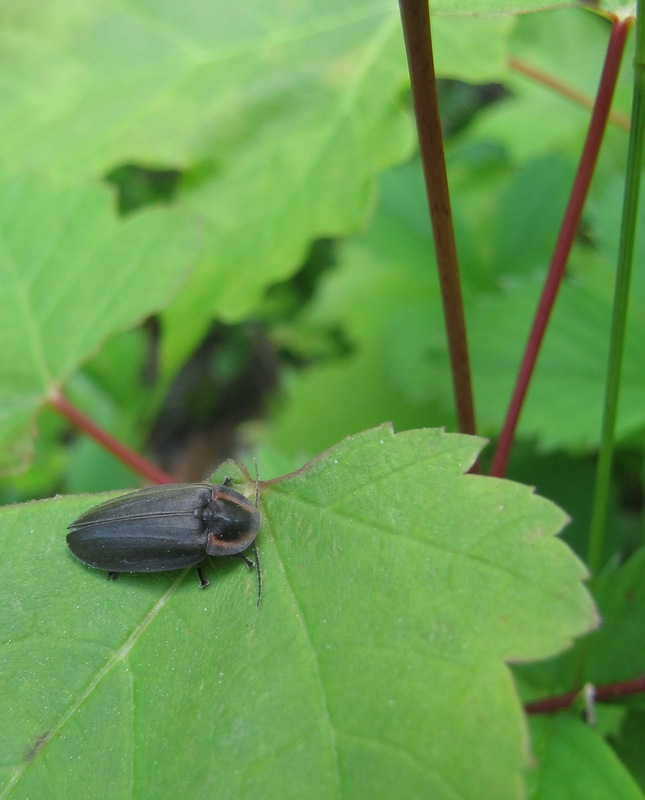 In the chapter "A Field Guide to Common Fireflies of North America," the genus Pyropyga, one of the "dark fireflies," is inexplicably omitted entirely. Pyropyga is by far the most common firefly where I live on the Front Range of Colorado, and also in the southwest U.S., but species are found across the entire continent. I have seen them virtually every place I have ever lived. Ok, so how does this book keep on giving? 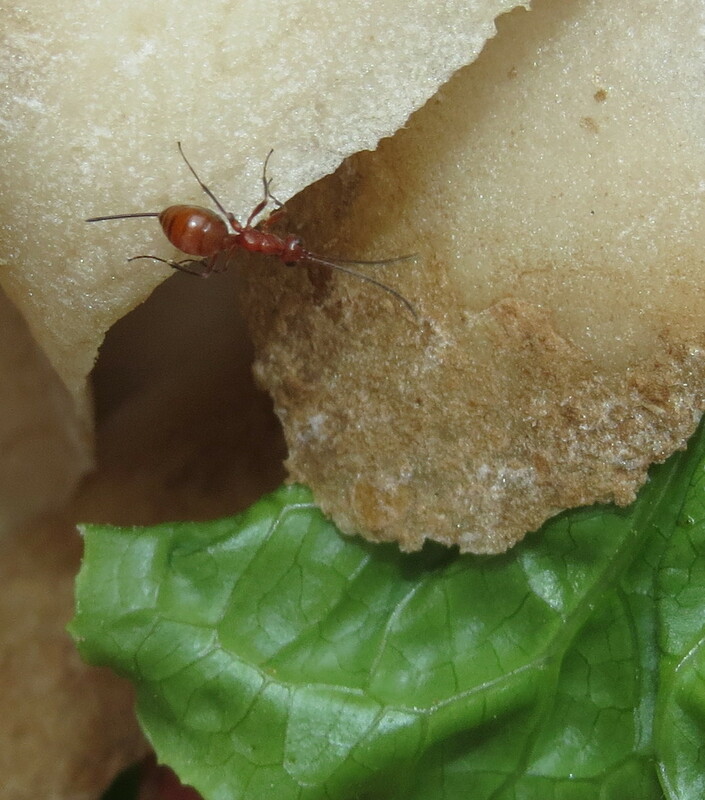 Lewis has complemented her treatise with an interactive book blog that is an ingenious way of keeping you up to date on the latest scientific findings, providing more information for specific species and genera, and otherwise involving her readers in the process of discovery. She has also given a TED Talk on the subject of fireflies. 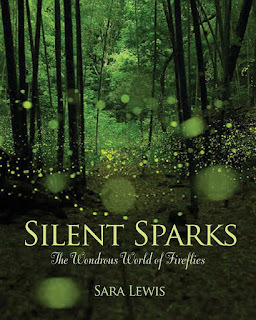 Oh, and don't forget the book itself has a whole chapter called "Stepping Out - Further Firefly Adventures." 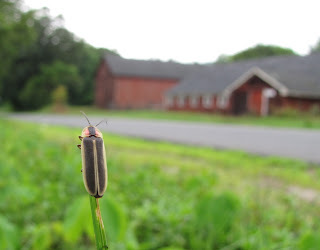 There you will learn how to become your own scientist and contribute to what we know about fireflies. The "Notes" are rich in additional publications, links to online resources, and other material. 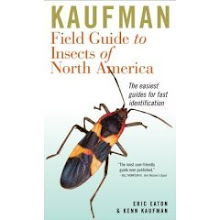 This hardcover work, priced at $29.95 U.S., is a must addition to the library of every naturalist, even if they specialize in other organisms. It is a brilliantly organized volume rich in both content and inspiration. Well done, Sara Lewis. Last Hurrah or New Normal? Dateline: Colorado Springs, Colorado, USA, November 16, 2016. The temperature today reached a high of 77° F, quite abnormal for this time of year. 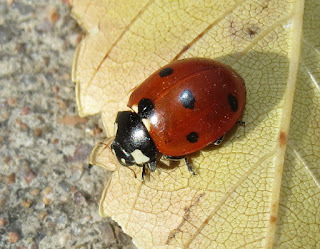 Walking for a couple of hours along the Rock Island Trail, a concrete bike path through the rural-suburban interface, produced a variety of insects that I might find, on average, no later than say early to mid-October, if that late. Weather trends are not looking good. There might actually be something to the whole global warming, climate change thing. It last rained here twenty-one (21) days ago, and that was but a trace. Last year we had snow by now, and concurrent cold temperatures, obviously. What our local climate now lacks in predictability it makes up for in extremes. 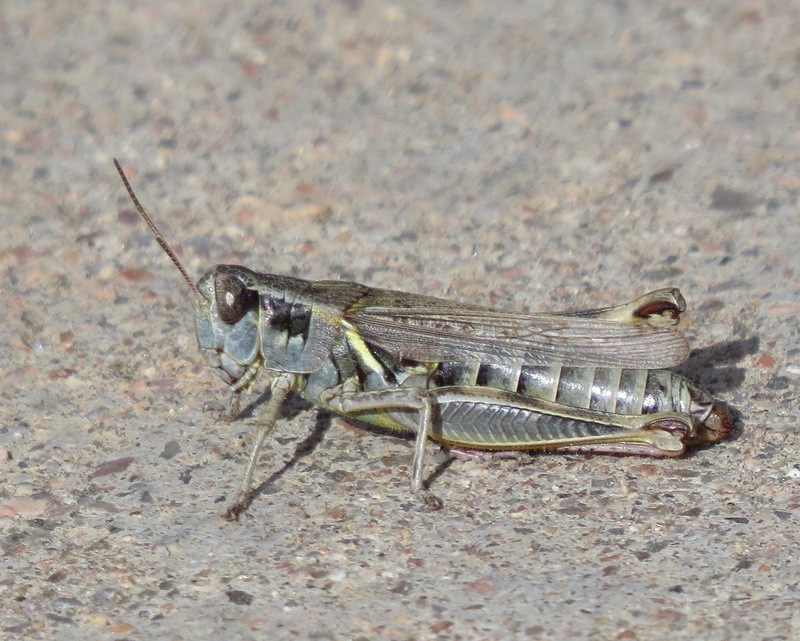 "Wait, latest update, I have seen 13 grasshopper species in two days (8 as adults, 5 as nymphs). What really scares me is that many of the nymphs are already 5th instars (last stage before adulthood), which I have never seen in fall, not even on warm days in January. 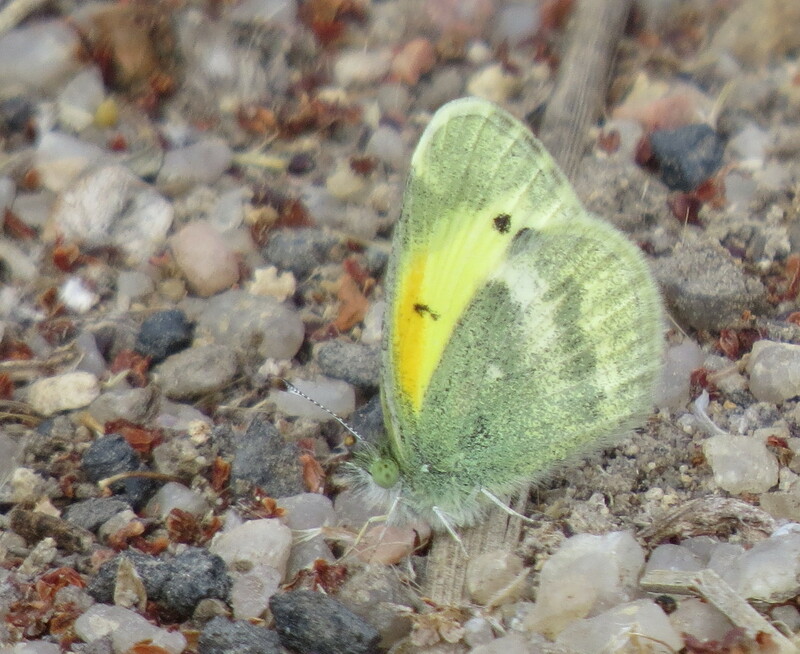 I am seeing many late butterflies, and I suspect most will be dead-ends as their offspring will not survive. 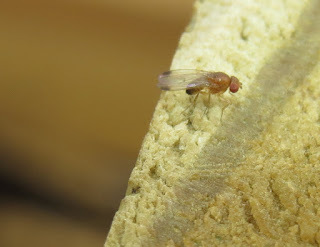 These are likely individuals that should have normally emerged next spring. 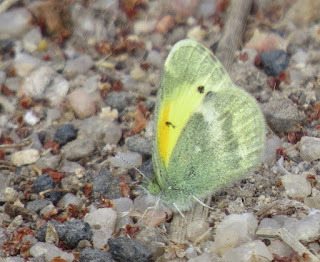 I have to wonder how many butterfly species are going to see a serious drop in numbers next year because of the messed up weather this fall. Pretty screwed up stuff! Ah, but I guess global warming is just a hoax, so it must be due to something else entirely." Mathew is obviously being tongue-in-cheek with his last comment, but it is important that each of us document what we are seeing. I, for one, am highly skeptical that the incoming federal administration is going to make major strides, if any at all, toward a better understanding of climate change, so it us up to citizen scientists to contribute what we can. 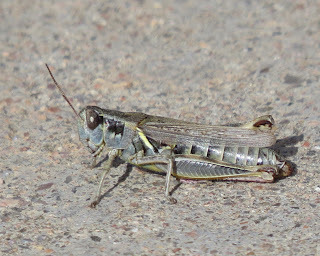 I found three species of grasshoppers as adults (and heard another one species crepitating in a field), and one as a nymph, yesterday. 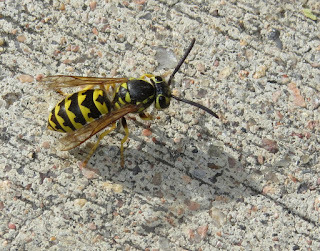 I even found a worker Western Yellowjacket on the trail that had probably collided with a cyclist a few minutes earlier. 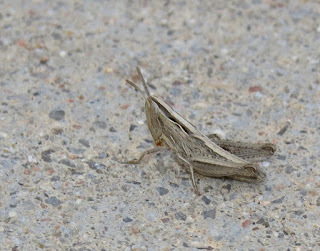 It spun around aimlessly on the concrete in a dizzy, disoriented kind of way, but eventually flew off. 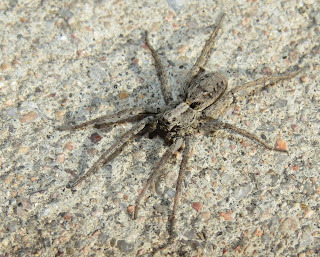 Vehicular traffic of all kinds takes its toll on insects and spiders, but that can be the subject of a future blog post. 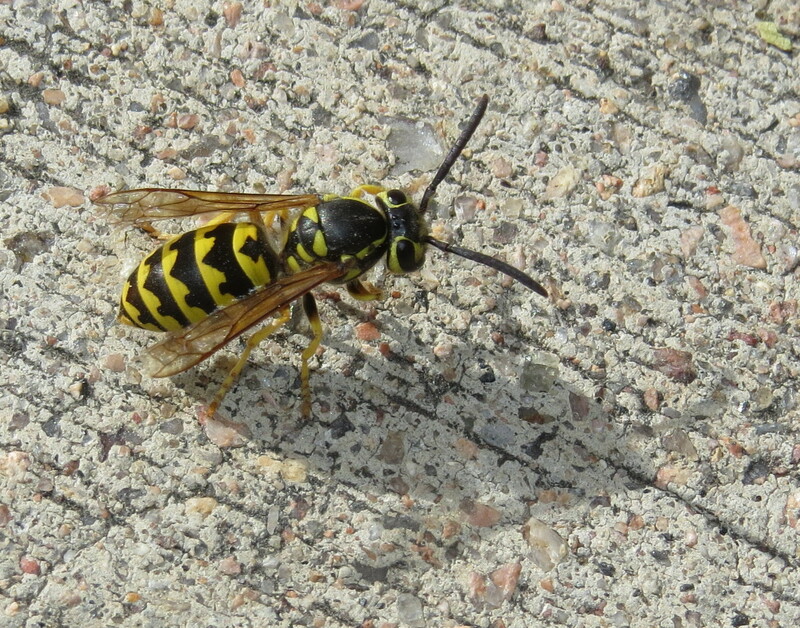 What is surprising is that there are any yellowjackets still present. Queens should have entered into hibernation by now, and workers and males should have perished back in October. 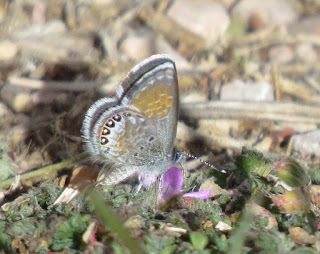 I spotted a shockingly fresh-looking Western Pygmy Blue butterfly, too, and perhaps even more surprisingly discovered it was taking nectar from tiny, blooming flowers. What plant in its right mind is blooming now? There are still roadside sunflowers looking as bright and healthy as the majority looked at their peak in August. I even see a few asters still clinging to life, and wild alfalfa flowers, too. 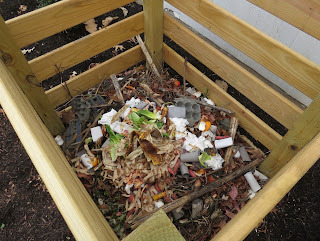 The other part of this story is that I, myself, am usually hunkered down for the winter, devoting my time and energy to editing images from the spring, summer, and fall, plotting stories to approach editors with, and otherwise confining myself mostly to the indoors. My brain is telling me that is what I should be doing, but my eyes and temperature sensors are kicking me out the door to continue exploring. My own biological compass is spinning wildly out of control. What are you observing and experiencing right now in your corner of the world? 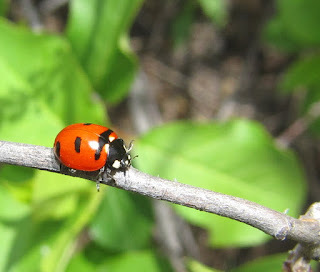 Anecdotal information is critical for a better understanding of trends in climate and weather, so I hope you will consider recording your observations on i-Naturalist, and your "spottings" to Project Noah, and any other relevant databases and resources. 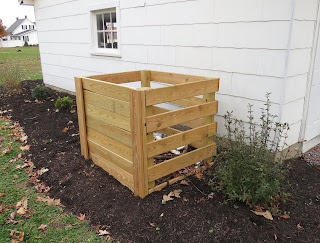 I'll be talking about another such resource soon, pertinent to personal and community gardens, and local agriculture. 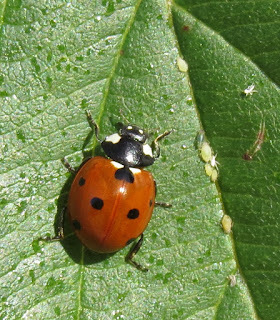 Changes in insect abundance and diversity will, obviously, have a profound impact on how we feed ourselves and each other. Stay tuned. 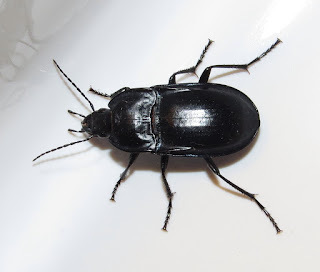 ID Tip: Ground Beetle or Darkling Beetle? 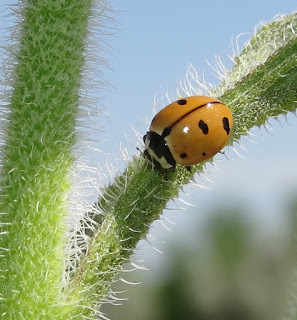 I have decided to begin a new, recurring feature here called "ID Tips" that will be designed to help naturalists, amateur and student entomologists, and others solve common and basic problems in insect and spider identification. Our first installment will explain differences between ground beetles (family Carabidae) and darkling beetles (family Tenebrionidae). The two are easily confused, but generally straightforward once you know what to look for. 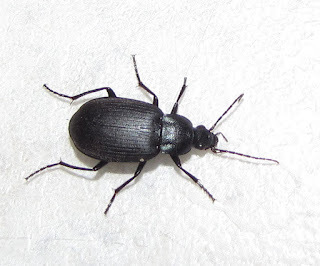 One glaring difference between carabids and tenebrionids is the structure of the antennae. 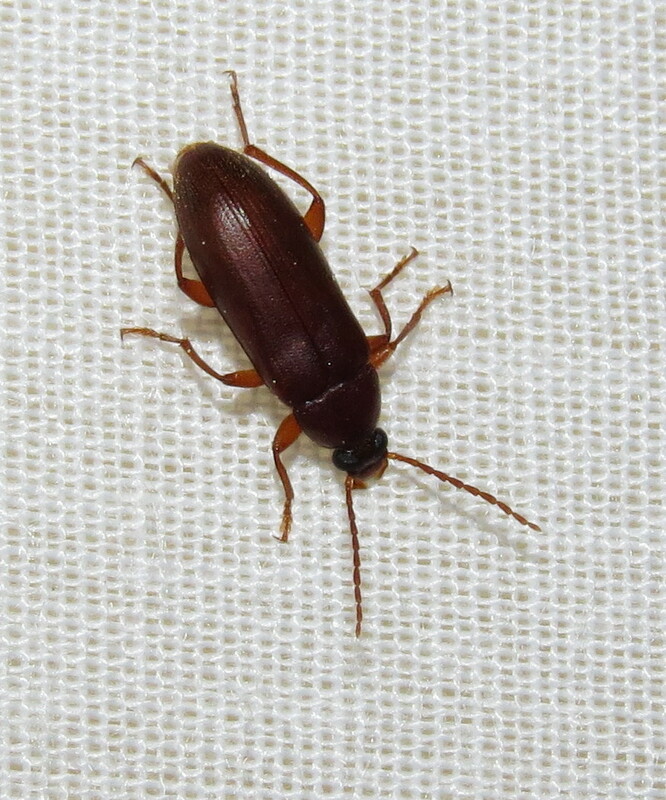 In ground beetles, the segments of the antennae are usually longer than wide, giving the antenna the appearance of a near single filament. Darkling beetles have mostly bead-like segments, such that the antenna resembles one of those keychains that closes by pushing the filament between the beads into a clasp. This is not a foolproof character, but works enough of the time that it will help you make a quick determination. Look also at the front of the head. Are the mandibles (jaws) exposed and directed forward? 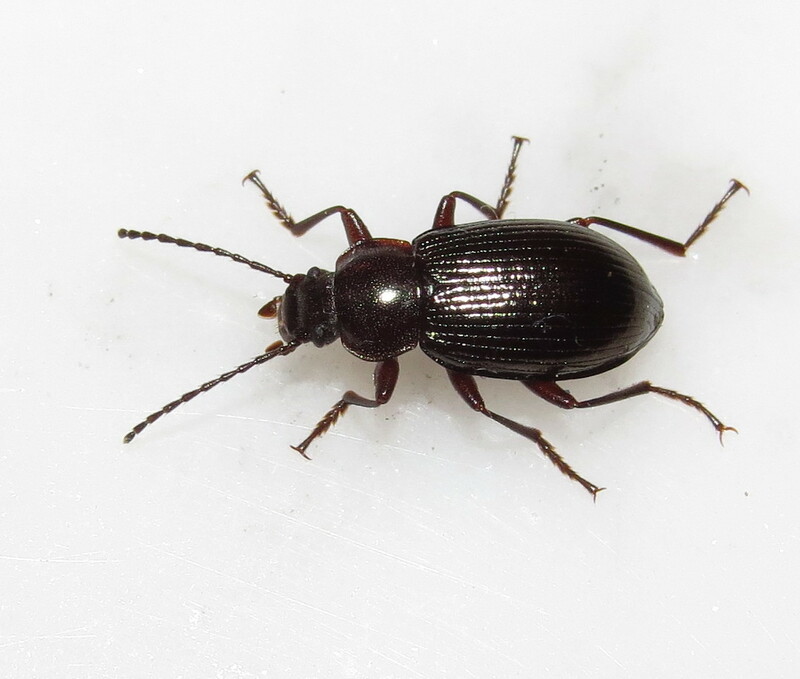 If so, then you have a ground beetle or another kind of predatory beetle. Conversely, if the mandibles are concealed beneath the clypeus ("upper lip" if you will), then it is likely your specimen is a darkling beetle or another beetle that feeds on vegetation or detritus. Does your beetle move very rapidly by running? This is another characteristic of ground beetles. 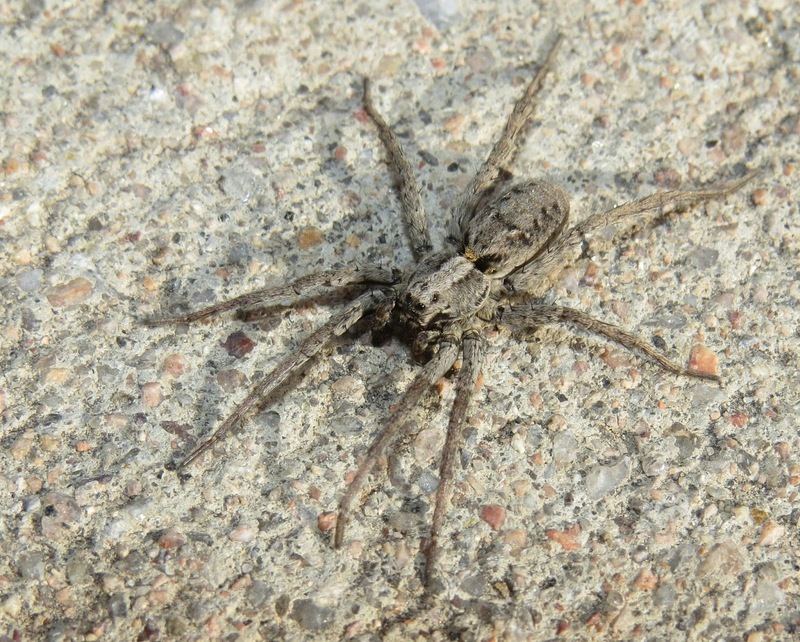 Many species are so fast that it is a real challenge to catch them for closer examination. 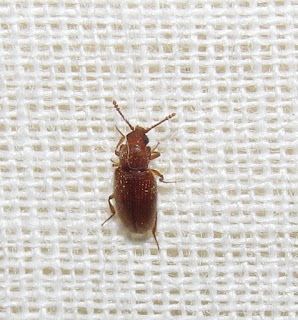 Does your beetle lumber along slowly or only run fast when prodded? 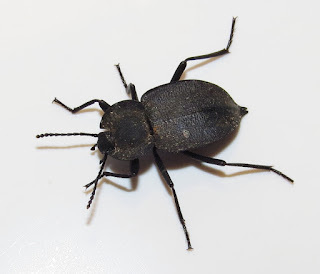 Chances are you have a darkling beetle then. Many darkling beetles rely on a very dense exoskeleton to repel attacks by predators, and consequently don't feel the need to flee in haste. 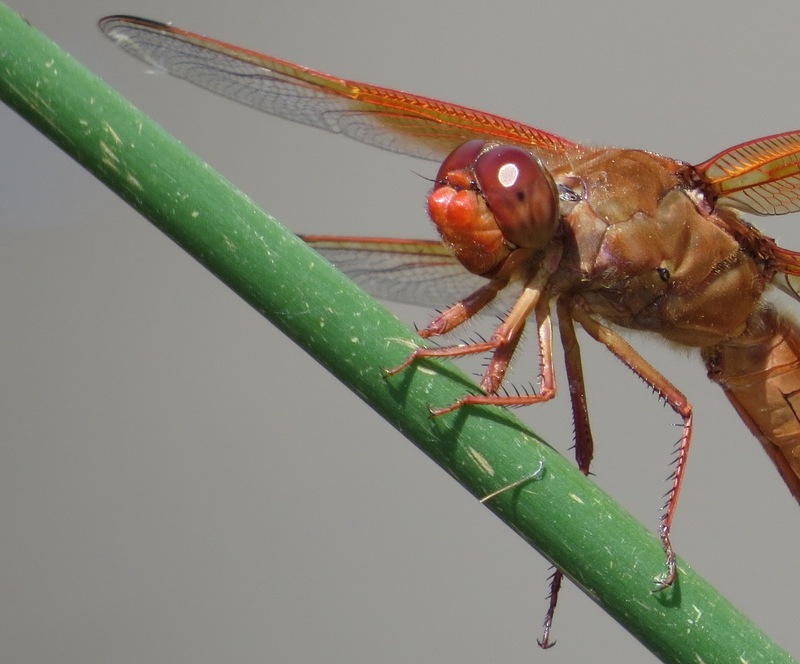 Desert and prairie species may even have the wing covers fused to help limit water loss. 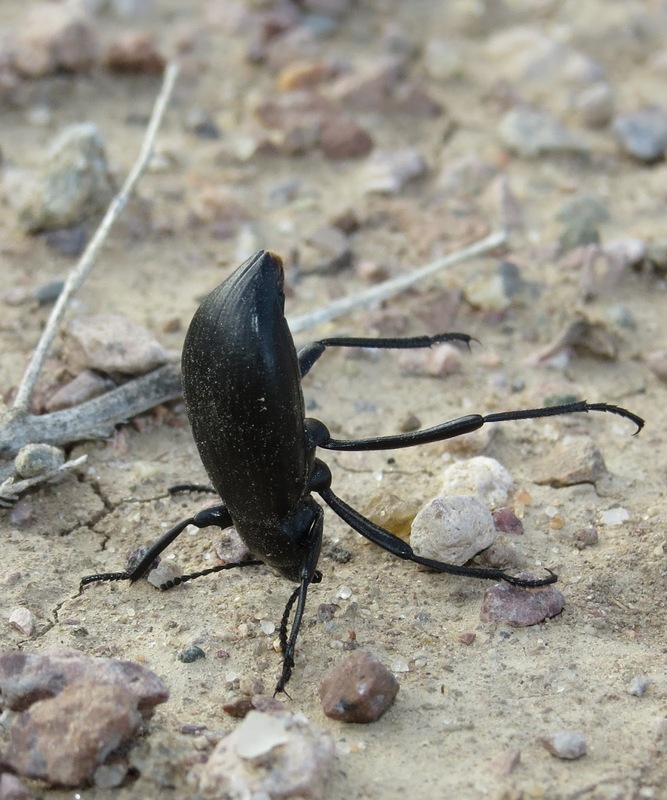 Does your beetle stand on its head when disturbed? This head-standing behavior is characteristic of the darkling beetle genus Eleodes, and some other closely-related genera. Both darkling beetles and ground beetles can have extremely effective chemical defenses that include pungent, permeating aromatic compounds released from abdominal glands, so smelling your beetle to make an identification is not only a potential exercise in futility, it can be highly unpleasant if not injury-inducing. 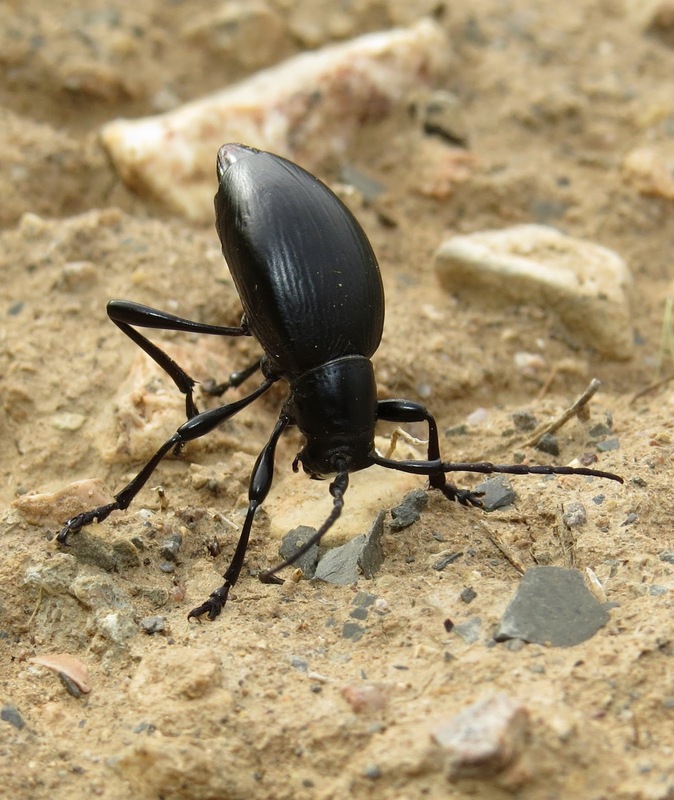 Habitat is not a good way to distinguish ground beetles from darkling beetles. 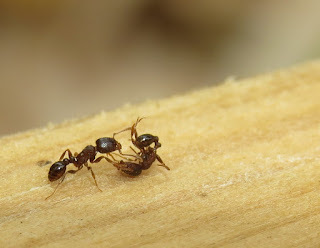 Both can be found in a variety of habitats, and are especially abundant and diverse in aridland ecosystems. 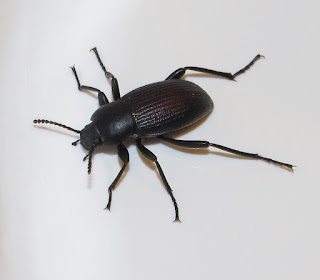 Because both carabids and tenebrionids are well-defended insects, they are mimicked by a variety of unrelated insects. 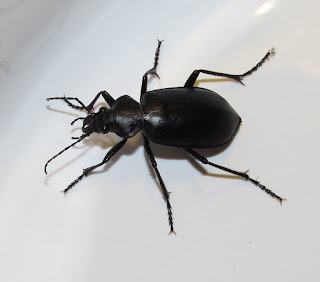 One prime example is the longhorned beetle genus Moneilema, which mimics Eleodes darkling beetles not only in appearance, but behavior. The longhorned beetles, which feed mostly at night, on cactus pads, move slowly and even stand on their heads like Eleodes. They have no chemical defense to back-up their warning posture, but the bluff works fine on all but the most desperate of insectivores. 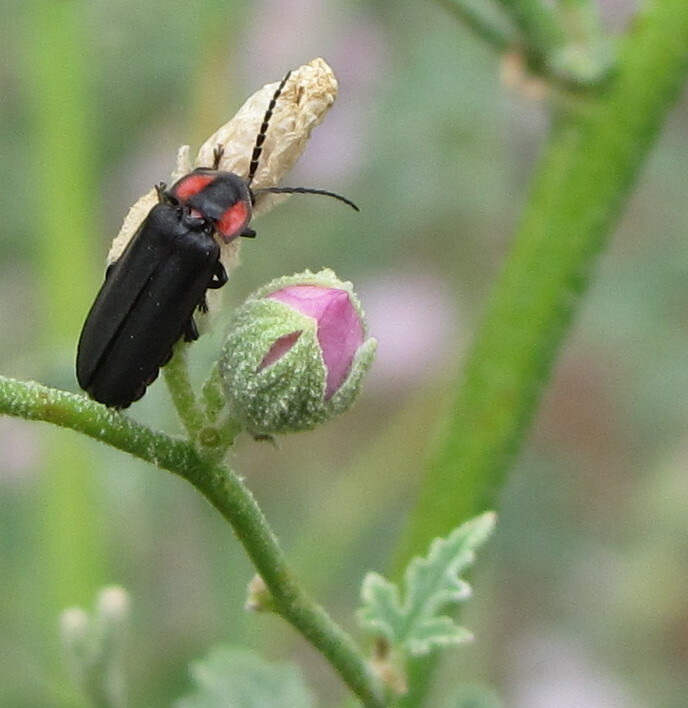 Cactus longhorned beetle (Moneilema sp.) 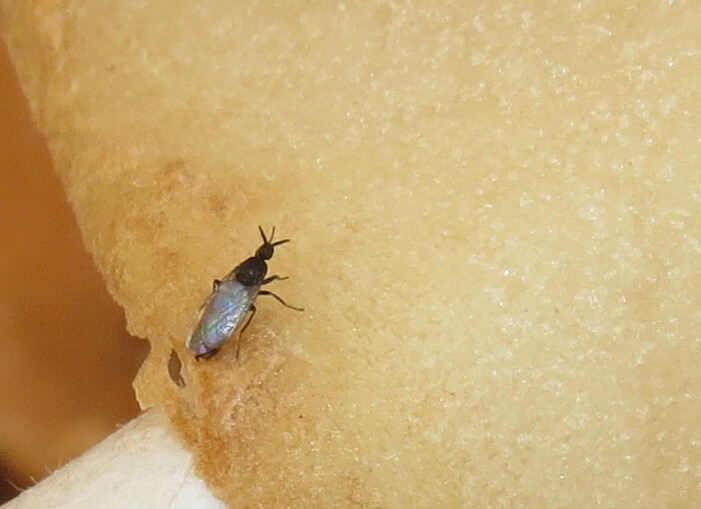 mimicking Eleodes spp. Another complication is the relatively recent assimilation of two former beetle families into the Tenebrionidae, many of which do not resemble "classic" darkling beetles. These are the comb-clawed beetles (subfamily Alleculinae) and long-jointed beetles (Lagriinae). 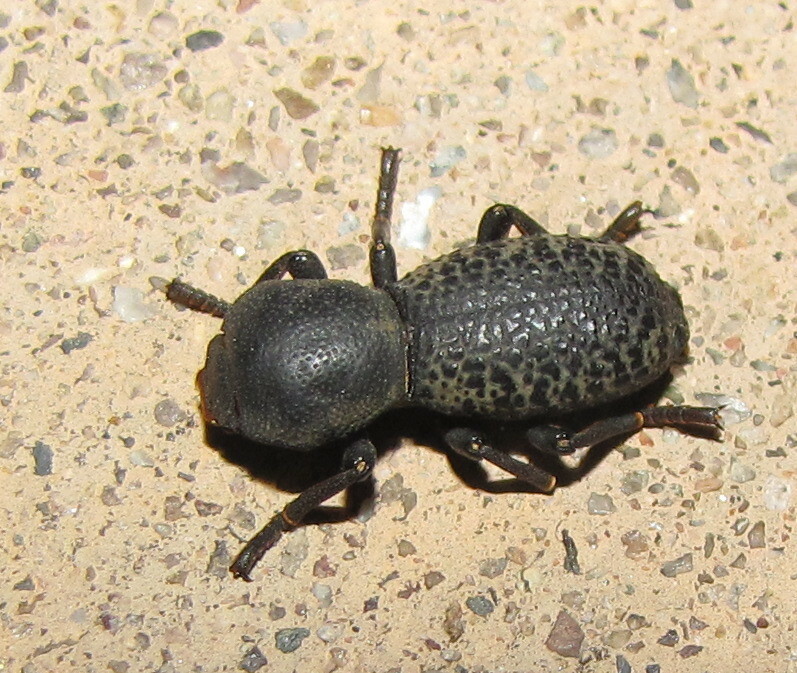 In contrast, the "ironclad beetles" in the family Zopheridae were once members of the Tenebrionidae. 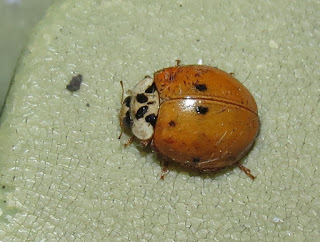 They include beetles so well-armored that entomologists have extreme difficulty in pinning specimens that they collect. 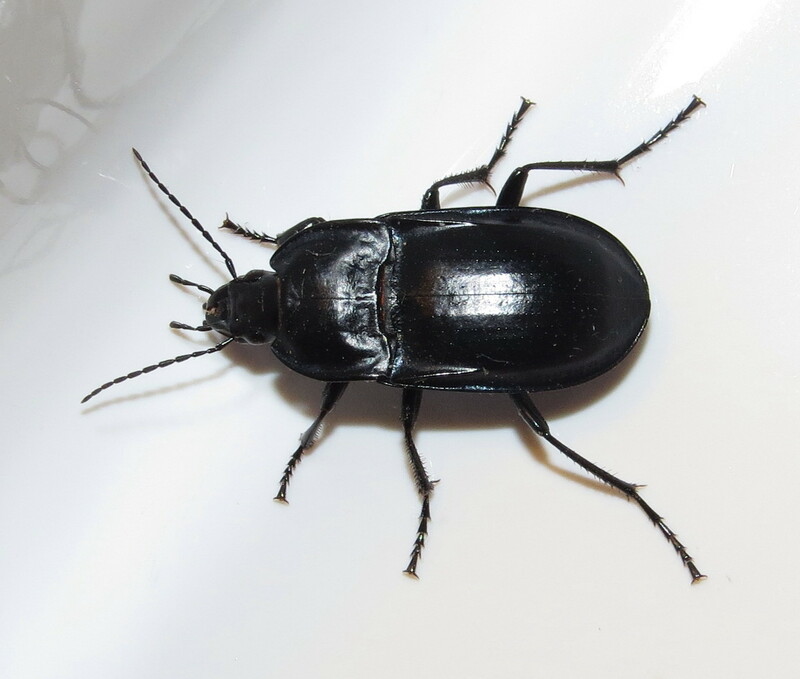 No single character is probably reliable by itself, and it is recommended that one use a dichotomous key, in a technical book or online, to reach a firm conclusion on the identity of your beetle. 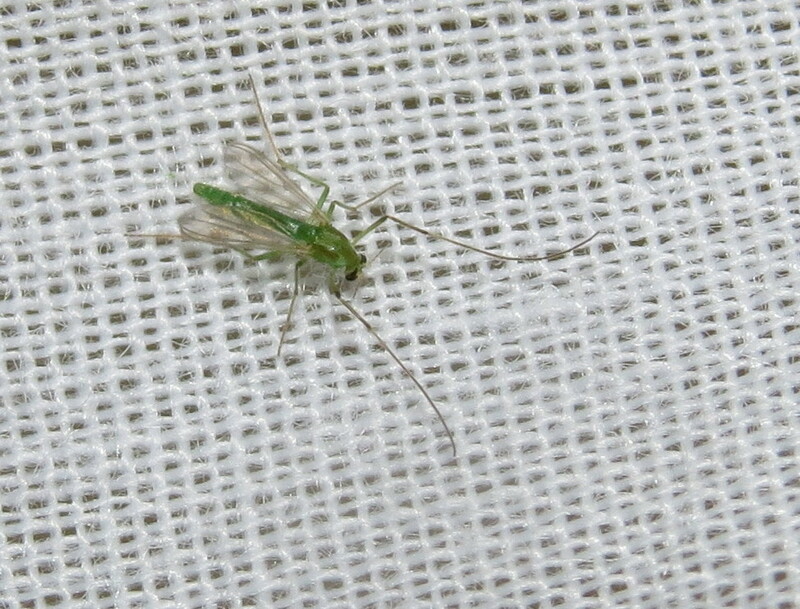 It is also a great idea to invest in a good dissecting (binocular) microscope. Good luck! Don't Ignore the Small Bugs! If I learned anything at the blacklight in our backyard this year, it was to not ignore the small stuff. 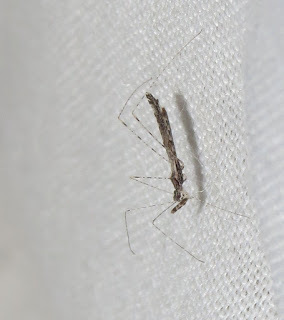 Naturally, trying to find statistical documentation of the average length of insects in millimeters, I failed. 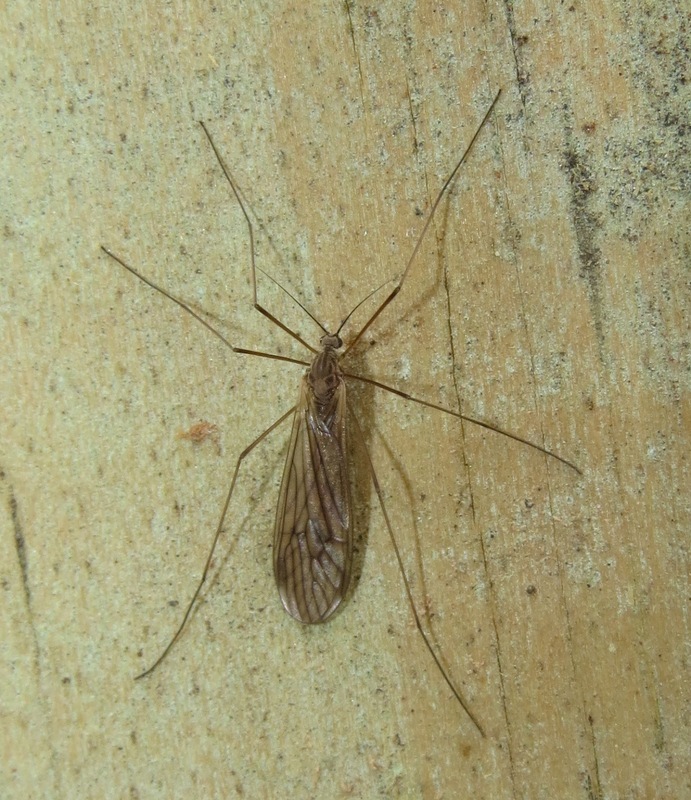 Surely, the overwhelming majority of insect species measure less than ten millimeters. 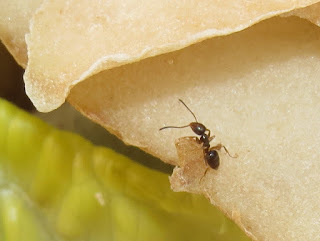 Heck, entire orders of insects are comprised of species that rarely exceed five millimeters. Lice, booklice, and barklice for example; and fleas as another case in point. 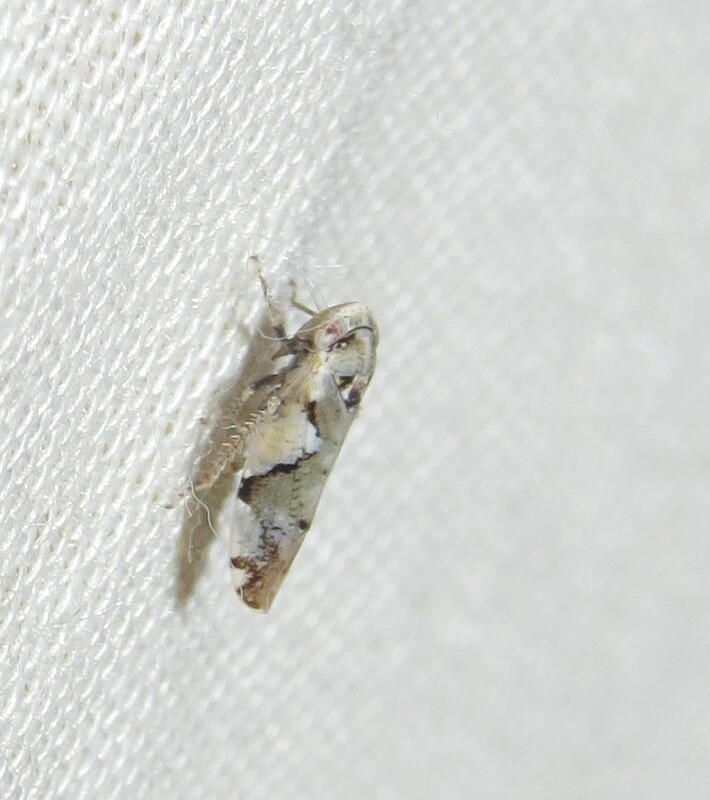 Battaristris concinusella, the "Music-loving Moth"
Most of the moths that came to our blacklight were in the category known as "microlepidoptera," and shockingly small compared to what one normally considers moth-like. 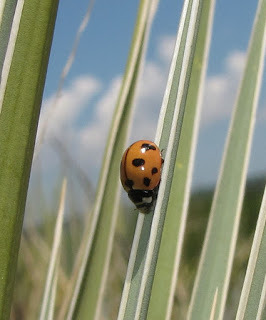 Some of these insects spend their caterpillar stage mining between the layers of a leaf, boring inside a grass stem, tucked inside a rolled or tied leaf, or otherwise hidden from view in the most unlikely places. 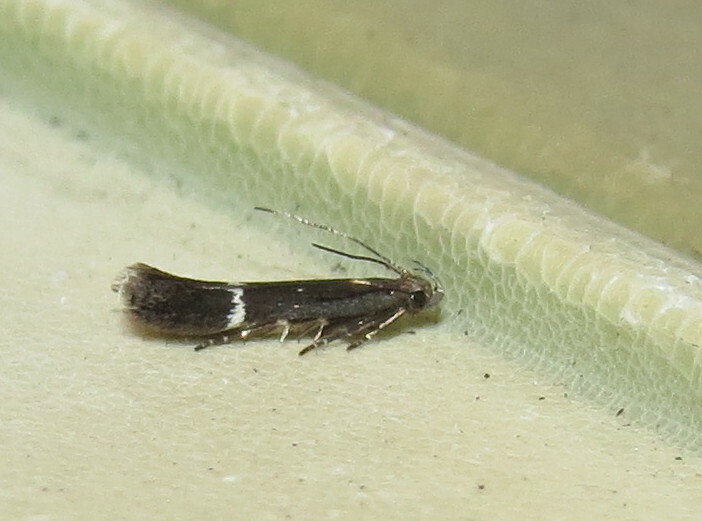 Syncopacma nigrella, a "twirler moth"
It is a real challenge to photograph microlepidoptera, but well worth the effort. 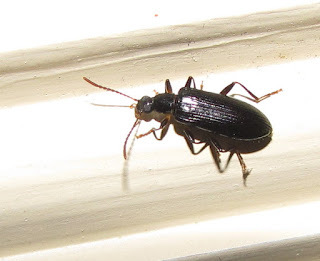 The geographic distribution of many species is largely unknown, and simply turning on your porch light and imaging what alights there can lead to county or even state records. 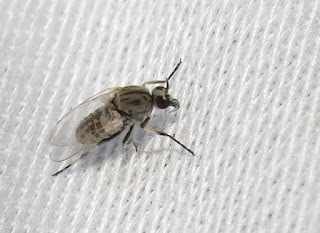 You can post your pictures to any number of forums, Facebook interest groups, or citizen science websites to get the specimens identified....maybe. 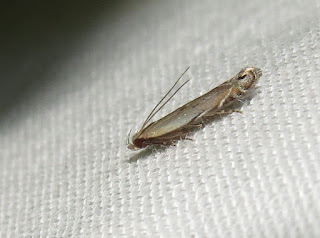 Many species require dissection of the genitalia to confirm their identity. 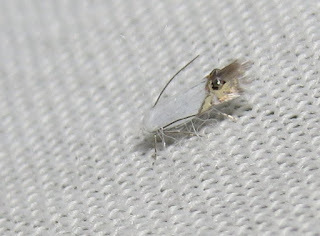 The beauty of the tiny scale-winged creatures boggles the mind. Some have lance-shaped wings with long scales that fringe the tips and make the wings look more like feathers. Some have scales that are so reflective that your camera flash bounces right off and blows out every image. 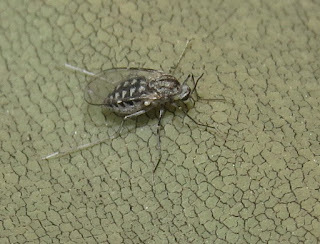 Some have a metallic sheen. 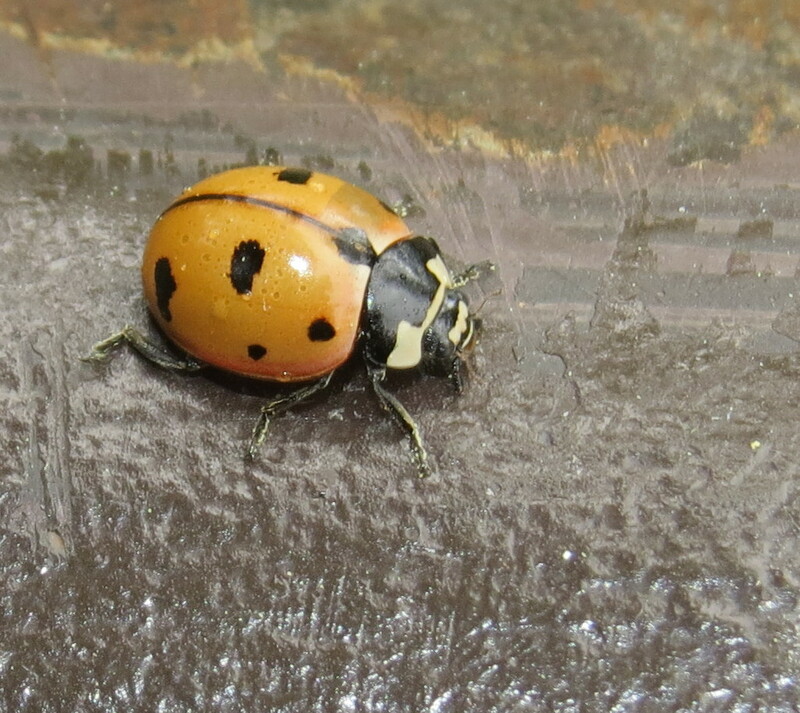 A few have false eyespots designed to get potential predators to attack the wrong end of the insect. 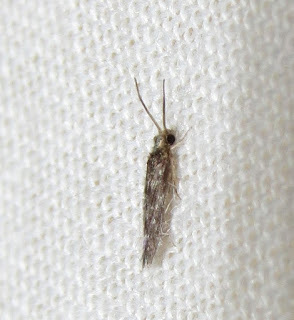 I imaged one impossibly tiny moth that I soon learned was not a moth at all. The microcaddisflies in the family Hydroptilidae are exactly that. 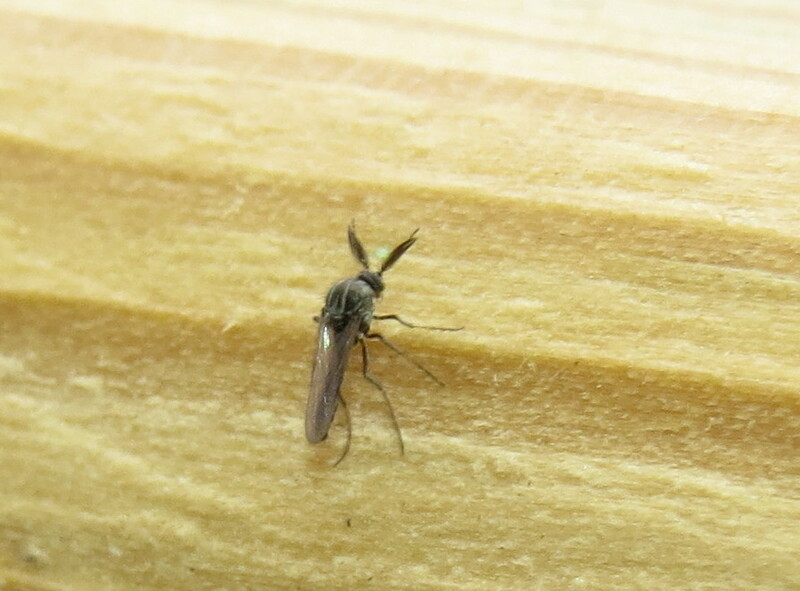 They are only 4-5 millimeters from "nose" to wingtip. 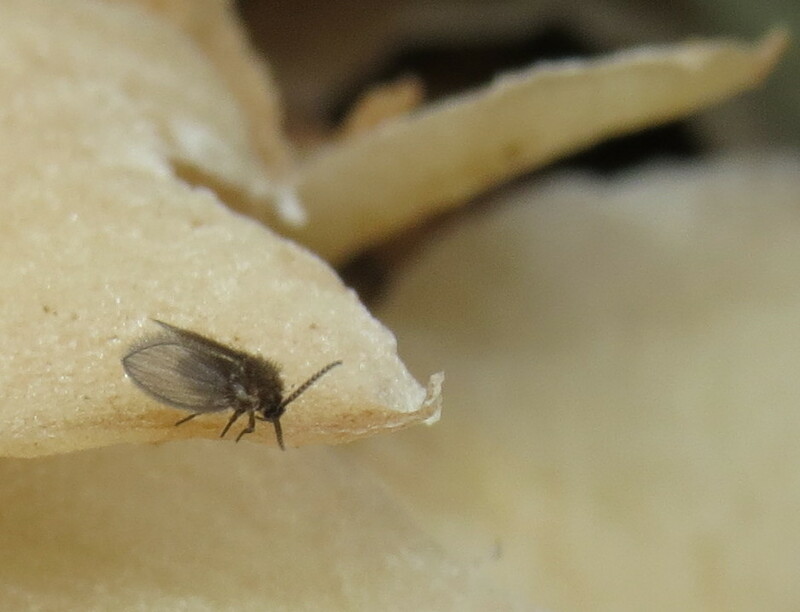 We don't have any hospitable aquatic habitat within about half a mile of our yard, but caddisflies in general are able fliers, traveling long distances as adult insects. 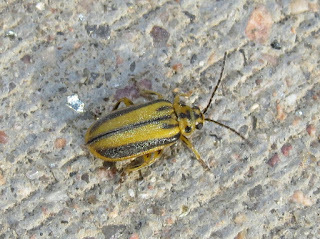 Not to be outdone by moths, beetles can also be tiny. Among the more common species that appeared at our blacklight belonged to families that consist almost entirely of very small members. Minute brown scavenger beetles, family Latridiidae, showed up consistently. 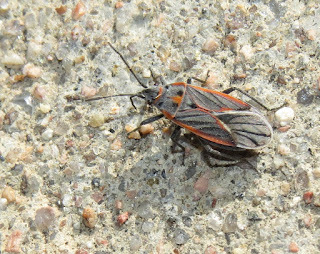 So did shining flower beetles in the family Phalacridae. 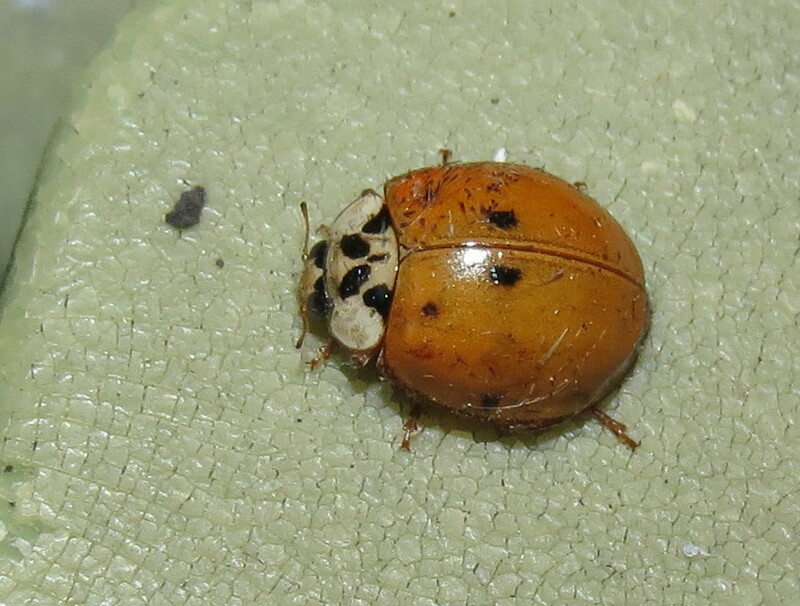 Very small flea beetles in the leaf beetle family Chrysomelidae appeared in fair numbers, too. They often vaulted out of camera range just before I snapped the shutter. The majority of flies coming to our night light were also miniscule. Dark-winged fungus gnats, family Sciaridae, were most abundant, but a diversity of non-biting midges, family Chironomidae, were omnipresent most nights. Few biting flies are attracted to lights at night, but we did have a handful of "no-see-ums," biting midges in the family Ceratopogonidae. 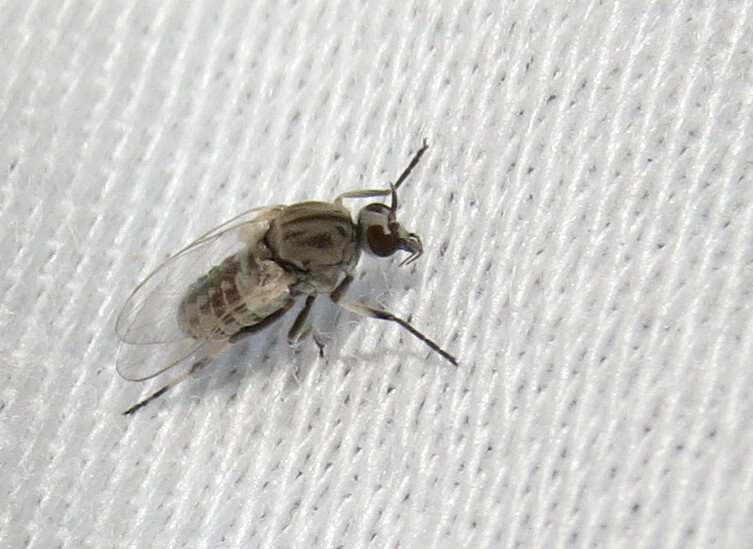 The majority of these flies actually feed on the blood of other insects rather than vertebrates. To my surprise, a lone female black fly, family Simuliidae, also came in one night, but none were seen before or since. They are also aquatic in the larval stage, as are mosquitoes, most midges, and no-see-ums. 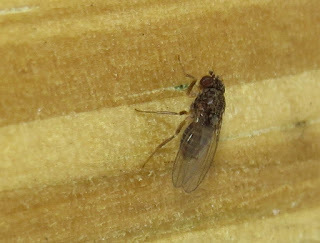 I am still trying to identify several flies that came in. 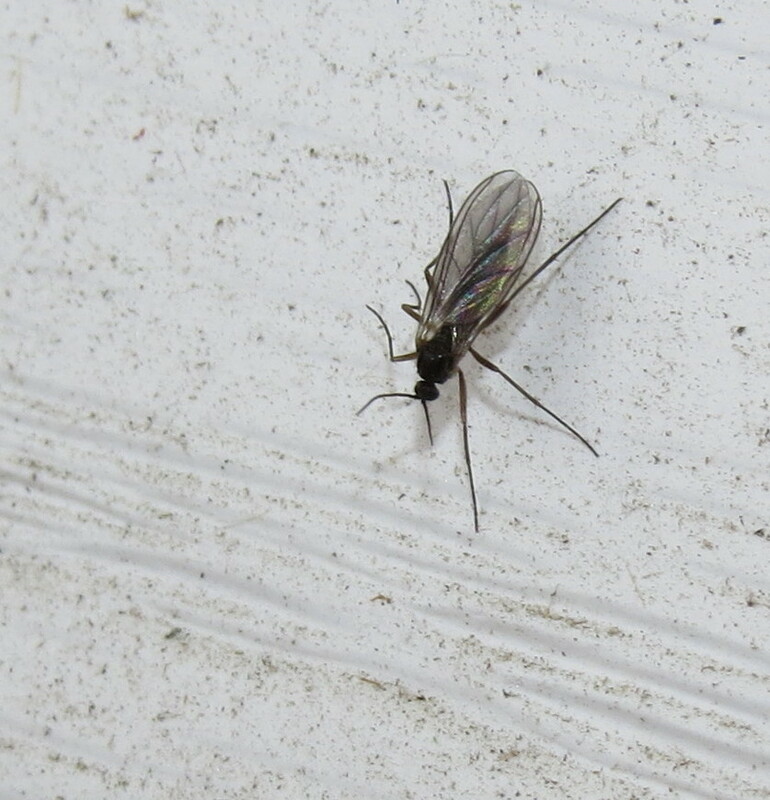 I did manage to identify to genus one of the ubiquetous gall midges in the family Cecidomyiidae. 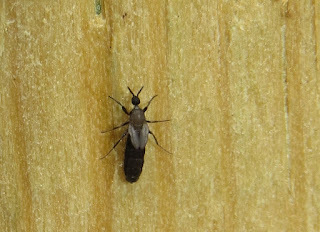 Lasioptera is a lovely black, gray, and white insect. 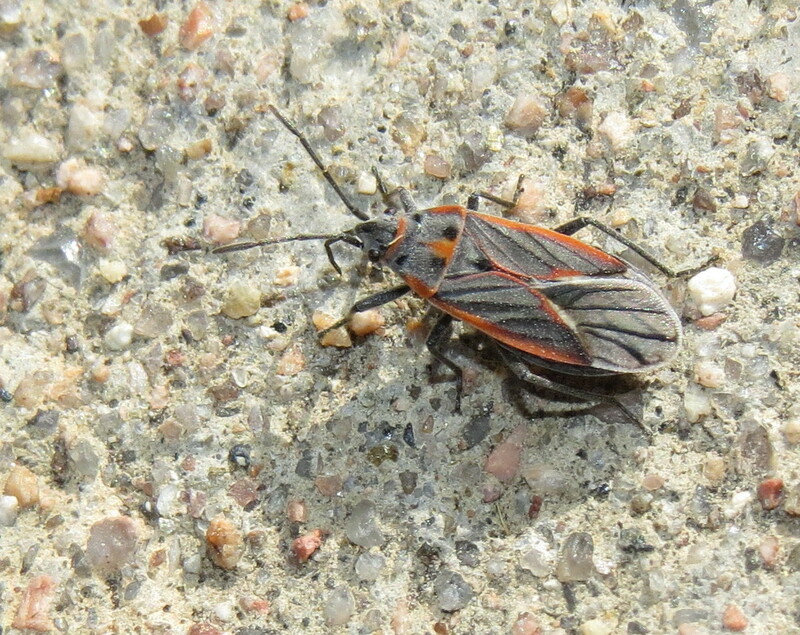 True bugs can also be very small, especially members of the enormous family of plant bugs, the Miridae. I swear, it seemed that no two were alike; and I am not at all certain I'll be able to identify even a fraction of them. 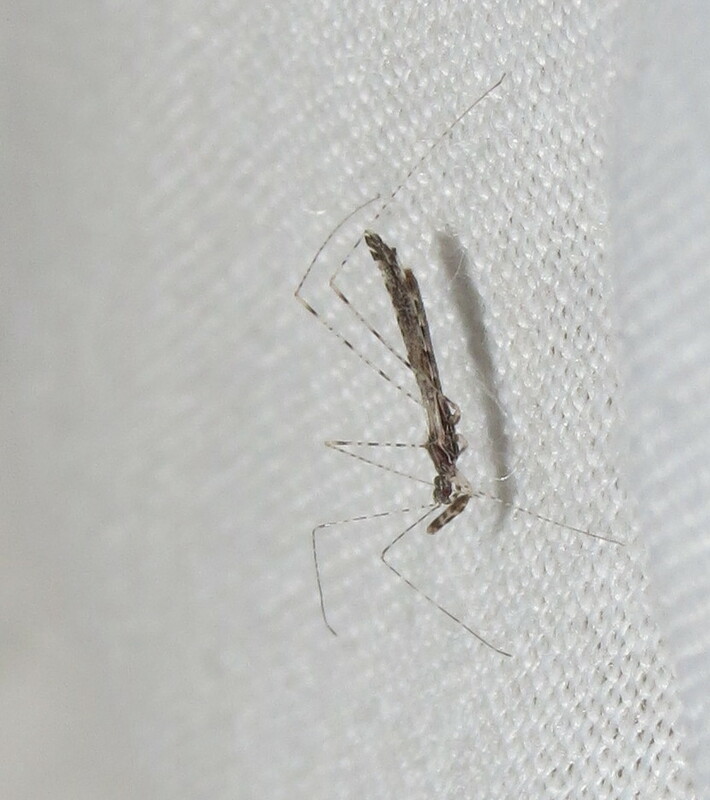 Meanwhile, to my delight, a thread-legged assassin bug, Empicoris species, showed up a couple of times, perhaps looking to dine on one of the smaller insects drawn to the ultraviolet light. 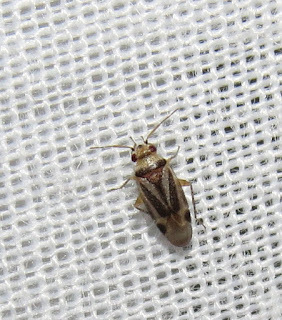 Leafhoppers in the family Cicadellidae are as much of a joyful pain as mirids in their sheer diversity. Look closely and you will also find planthoppers in the family Delphacidae, treehoppers in the Membracidae, and probably a few other odds and ends in the order Hemiptera. 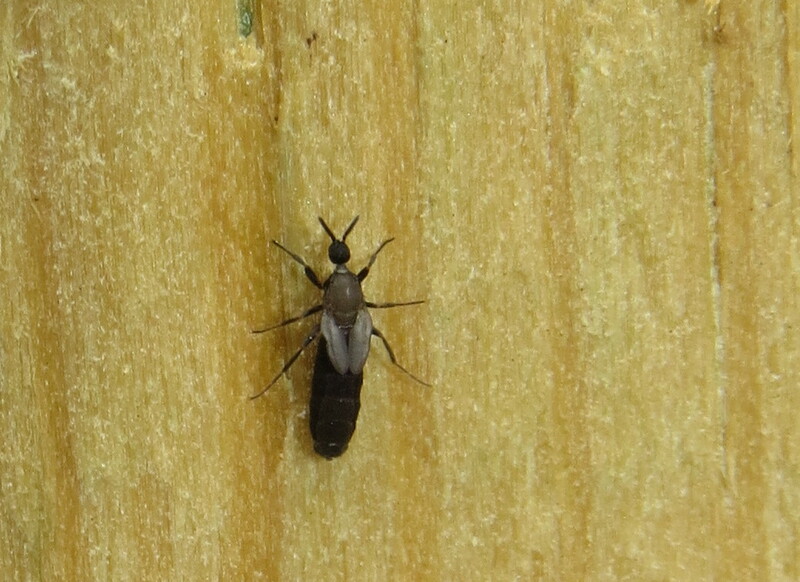 Believe it or not, there are a good number of nocturnal wasps that will come to blacklights. 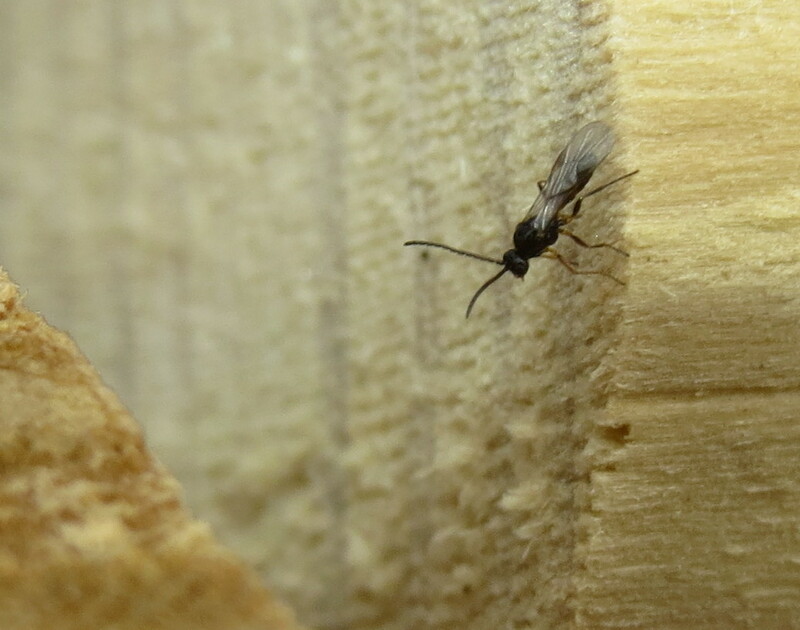 Most of them are parasites of other insects, and constitute what entomologists call "microhymenoptera." Do you detect a theme here? 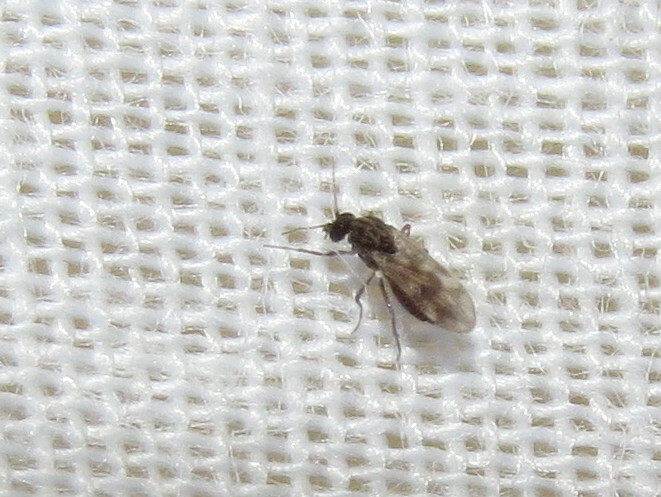 Some of the smallest insects known are "fairy flies" in the wasp family Mymaridae. 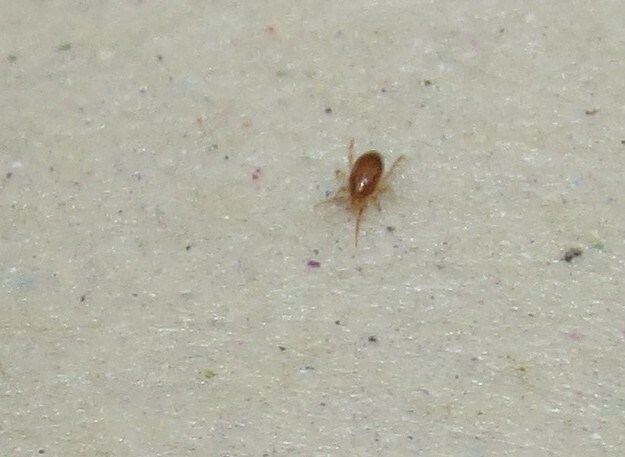 I did not detect any of those, but considering they can be well under one millimeter, chances are I could not have procured an image anyway. 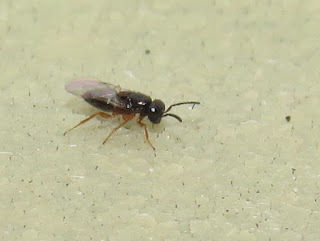 I settled instead for tiny braconid wasps and a handful of other wasps collectively lumped in the superfamily Chalcidoidea. Are you hooked yet on the micro-bugs? For a full spectrum of what I found just at the blacklight, check out my Flickr album for June, and alsoJuly, as well as the one I'm still working on for August through October. Meanwhile, you might try practicing your imaging skills on dead insects from indoors. Light fixtures tend to accumulate large numbers of small insects, and you might be surprised at what you find. Good luck to you; and remember that myself and others can be found at many online destinations to help you solve your mysteries.